Ralph Korte serves as Chairman of the Board of the Korte Company. He began the company in 1958, and today, it is a nationally recognized industry leader with more than 1,800 jobs completed across the nation. Throughout his career, Korte has held leadership positions on a variety of boards including president of the Southern Illinois Builders Association, chairman of the SIUE Foundation Board, chairman of the SIUE School of Business Advisory Board and chairman of the National AGC Education Committee. Korte has been involved in the creation and implementation of a number of new initiatives at the SIUE campus including: the new Construction Program in the fall of 1979; the construction of the Ralph Korte Stadium in 1993; the donation of the Ralph and Donna Korte Classroom; the creation of the Ralph & Donna Korte Fund for Leadership and Innovation in Business Education in 1999; and the launch of the SIUE Construction Leadership Institute in 2004.His professional activities have included the Illinois Business Roundtable, Emeritus Trustee of the Missouri Botanical Garden, Southern Illinois Builders Association, St. Louis AGC, Leadership Council and St. Louis RCGA. He has received numerous awards including the Ernst & Young Entrepreneur of the Year Award, Salute to Southwestern Illinois Award and the SIUE Distinguished Alumni Award. Korte is a lifetime member of the SIUE Alumni Association and serves on the SIUE Foundation Board. He is a member of the inaugural class of the SIUE Alumni Hall of Fame. Timothy Keenan is the Founder and Chief Executive Officer of HPTi, Inc., a mid-sized high-technology firm that supports federal government mission critical agencies, based in Reston, VA. Under Keenan’s leadership, HPTi has built the eighth fastest supercomputer in the world. The company was named one of the top 25 federal contractors by the Washington Business Journal, and was honored with the United States Productivity Quality Award Plaque of Excellence for 2006, 2007, and 2008. Keenan’s leadership and guidance has directly impacted a variety of programs through HPTi, including the USAF Advanced Weather Analysis Predicition System, the FBI Innocent Images, and the NOAA Forecast Systems Laboratories. Keenan serves on the Industry Advisory Council Future Forum, and is active with the Professional Services Council. Keenan has received a number of awards including the 2007 Government Contractors Association Executive of the Year, the 2007 American Business Awards Executive of the Year, the Wall Street Journal Best Boss of 2006, and the 2005 Ernst and Young Entrepreneur of the Year for Greater Washington. He has published papers on the subject of change management in high technology firms, and is an accomplished public speaker at government and industry forums. Keenan serves on the Board of Directors of the Fairfax Partnership for Youth, has been a coach of team sports for more than 18 seasons, and is a member of the Board of Advisors for three universities. Keenan is a member of the inaugural class of the SIUE Alumni Hall of Fame. Patricia Mercurio is president of Bank of America in Missouri. In this role, she is responsible for coordinating and integrating all product and service capabilities for all lines of business in Missouri, ensuring the delivery of the full resources of the Bank of America to clients and communities across the state. She serves as the senior banking executive for community and civic activities in the market. In addition, she serves as the Missouri/Southern Illinois market executive for Middle Market Banking. A native of St. Louis, Mercurio joined Bank of America in 1984 and has held a variety of management and executive positions in Human Resources and Operations. She was named president of Bank of America in St. Louis in 2000 and was promoted to her current position in 2001. Mercurio has served on numerous boards including the Girls Scouts, Urban League, St. Louis Zoo, the St. Louis Children’s Hospital board of trustees, the executive committee of the United Way board of directors and Civic Progress. As a member of the Greater St. Louis Economic Development Council at the RCGA, Mercurio works on downtown revitalization. She has visited SIUE as part of the Chancellor’s Residence Program to speak with students about her career. Mercurio is a member of the inaugural class of the SIUE Alumni Hall of Fame. Scott Alspach, also known professionally as Scott Spock, is the founding member of The Matrix, a seven-time Grammy-nominated songwriting/production team. He has received the Ivor Novello Award in Europe for Best International Pop Hit of the Year, BMI Songwriter of The Year, multiple Grammy nominations for Song of the Year and Producer of the Year, and the Canadian Juno Award for Pop Song and Album of the Year. The Matrix has co-authored and produced numerous number one songs on the Top 20 Billboard Charts in pop, rock, metal, AC and dance. Their songs have sold over 28 million records through the various artists with whom they work including Jason Mraz, Britney Spears, Hillary Duff, Liz Phair, Christina Aguilera, Shakira, Korn and David Bowie. Alspach is a member of the inaugural class of the SIUE Alumni Hall of Fame. Mark Showers is the Chief Information Officer of Monsanto Corporation. He has risen through the ranks at Monsanto during his 25 years there, and is currently responsible for the strategic direction of the company’s information technology resources, along with operations of information technology functions on a day-to-day basis. In 2007, Showers was named one of the Premier 100 Leaders in Information Technology by Computerworld Magazine. He has been recognized by St. Louis Commerce Magazine as one of the top CIOs in the St. Louis region. In 2006, Showers was a speaker at the CIO 100 Symposium & Awards Ceremony. Showers serves as the chairman of the St. Louis Coalition for Information Technology, the board chairman for the Technology Entrepreneur Center, a member of the Innovate St. Louis board of directors, and several advisory boards at Washington University. He also serves on the SIUE Foundation Board of Directors, and the Advisory Board for the SIUE School of Business. He is a member of the inaugural class of the SIUE Alumni Hall of Fame. Col. Flournoy is the Commander of the 932nd Airlift Wing at Scott Air Force Base. The 932nd’s flying mission is to provide first class airlift support for distinguished visitors and their staffs. The wing maintains the C-9C and C-40C aircraft for VIP special assignment missions and prepares citizen airmen to support and maintain all facets of air base operations. Prior to Scott Air Force Base, Col. Flournoy served as Director of the 22nd Air Force Operations at Dobbins Air Reserve Base, Georgia. Col. Flournoy entered the Air Force in 1986 as a graduate of the Reserved Officer Training Corps at SIUE. While on active duty, he served as a B-52 pilot, and a T-37 instructor pilot. Since joining the Air Force Reserve in 1991, he has deployed in support of Operations Southern Watch, Provide Comfort, NOrthern Watch, Eduring Freedom and Iraqi Freedom, flying the HH-60G and commanding a C-130H Operations Group. Col. Flournoy has served at the Pentagon and, most recently, as the Director of Operations for 22d Air Force. He is a command pilot with more than 3,375 flying hours and has received numerous major awards and decorations, including the bronze star, the meritorious service medal, the air medal, and the aerial achievement medal. He is a lifetime member of the Alumni Association as well as a member of the inaugural class of the SIUE Alumni Hall of Fame. Dr. Valerie Murrah is the Professor and Chair of the Department of Diagnostic Sciences and General Dentistry at the University of North Carolina in Chapel Hill, with joint appointments in Pathology and Laboratory Medicine and Otolaryngology. She also directs the Division of Oral & Maxillofacial Pathology and serves as the Oral and Maxillofacial Pathology Diagnostic Laboratory Director. Dr. Murrah is a fellow of the American Academy of Oral and Maxillofacial Pathology, a fellow of both the American and International College of Dentists, and a Diplomat of the American Board of Oral and Maxillofacial Pathology. She is currently President of the American Academy of Oral & Maxillofacial Pathology and is the first woman to be elected to that position, as well. She served for four years on the Council on Scientific Affairs of the American Dental Association and also serves as a specialty site visitor for the Commission on Dental Accreditation. Dr. Murrah has received awards for teaching excellence at multiple universities. She is a nationally and internationally recognized speaker on oral cancer. Her research focuses on oral carcinogenesis and an animal model of proliferative verrucous leukoplakia and has been supported by the National Institutes of Health, the American Cancer Society, the American Heart Association and the Smokeless Tobacco Research Council. Dr. Murrah is a member of the inaugural class of the SIUE Alumni Hall of Fame. Maureen Black is the Executive Director and owner of Black Bear Academy & Clinical Assist, Ltd. in Chicago, Ill. Following her graduation from SIUE, Black founded two companies that provide therapeutic services for both adults and children with communication disorders. Her first company, Clinical Assist, provides speech and language therapy services to Chicago area schools, hospitals, pediatric clinics and TBI programs. The companion company, Black Bear Academy, has three distinct programs that provide academic and therapeutic services for preschoolers through kindergarten. The primary goal of Black Bear Academy is to support the transition of children with speech and language disorders in to neuro-typical classrooms prior to first grade. Black is an active member and participant with the Illinois Speech-Language Hearing Association, the American Speech-Language-Hearing Association, the National Association for Education of Young Children and the Illinois Association for the Education of Young Children. Black is a member of the inaugural class of the SIUE Alumni Hall of Fame. Dr. Frances Karanovich is the Assistant Professor of Education Leadership at SIUE. She has more than 30 years of teaching and administrative experience ranging through elementary, middle, high school and college. Karanovich is a recognized guest speaker presenting workshops, seminars and staff development courses on such topics as school climate, intra and inter school community strategies, school finance and educational leadership. She has received numerous awards including the 2005 Illinois Superintendent of the Year from the American Association of School Administrators and the 2000 “Break the Mold Award” for vision and leadership in educational excellence from the Illinois State Board of Education. Karanovich has served a variety of professional and community organizations including the Funding Information Accountability Committee of the Illinois State Board of Education, Governor Blagojevich’s Education Task Force and the McDonough County Housing Authority Board of Directors. She is a lifetime member of the SIUE Alumni Association and a member of the inaugural class of the SIUE Alumni Hall of Fame. Paul Galeski is the Chairman and Chief Executive Officer of Maverick Technologies in Columbia, Ill. Following graduation from SIUE, Galeski began his professional career working as a control systems engineering with various companies including McDonnell Douglas Corporation, Monsanto Chemical Company and Anheuser-Busch. Galeski’s most notable accomplishments include building two engineering companies and growing each one into a major global service provider. He founded Magnum Technologies in 1989 and Maverick Technologies in 1999. Galeski has served as part of several organizations and task forces charged with advancing the engineering field including the the ISA Certified Automation Professional (CAP) Program steering committee and the Automation Federation’s workforce development team. Galeski was recognized by Ernst & Young’s Entrepreneur of the Year Program as the Emerging Entrepreneur of the Year for the State of Illinois in 2002 and was listed on the 40 under 40 of top St. Louis-area executives under age 40. Galeski has served as the advisory director for the SIUE School of Engineering and established the Maverick Technologies LLC Scholarship in Engineering at SIUE. He is a lifetime member of the SIUE Alumni Association and a member of the inaugural class of the SIUE Alumni Hall of Fame. Richard Oller is the Chief Executive Officer and President of Oller Engineering, Inc., a civil/environmental consulting engineering firm based in Lubbock, Texas. Oller is responsible for the overall direction of OEI by being involved in the design process and operations of various municipal water and wastewater systems. Through OEI, Oller has been very active in water resources development throughout Texas especially in West Texas and The Panhandle region. He has designed two Arsenic units used in the removal of Arsenic from municipal water supplies. He has also designed and completed approximately 20 wastewater treatment facilities throughout Texas. Oller is a registered engineer in Texas, a Registered Environment Professional, and a Certified Public Manager, (CPM). He is also an active instructor with Texas Water Utilities Association. 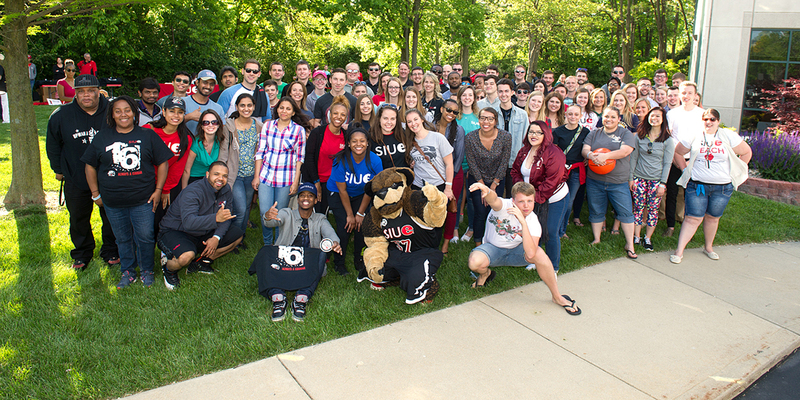 Oller is a lifetime member of the SIUE Alumni Association and a member of the inaugural class of the SIUE Alumni Association. Crystal Lask is the Patient Safety/Quality Improvement Coordinator at Barnes-Jewish St. Peters Hospital in St. Peters, Mo. After only two years as a staff nurse, Lask’s manager described her as "a true leader, inspiring others with her positive attitude and compassion, mentoring new staff and demonstrating outgoing problem solving abilities." In her current role at Barnes-Jewish, Lask met with key physicians and nurse leaders to share information about evidence-based practice and in so doing, improved system-wide scores from 7th in the BJC system to 2nd. Lask continues to expand her knowledge base in the field of nursing. She acquired special training in Lean Six Sigma and has utilized her new skills to redesign work processes to both improve the flow for the staff as well as ensure the best possible care for the patients at Barnes-Jewish. Lask is a member of the inaugural class of the SIUE Alumni Hall of Fame. Nancy Weston is the Vice President of Nursing Services at Memorial Hospital in Belleville, Ill. Weston has made significant contributions to the nursing profession and has exhibited excellence in nursing administration by choosing the pursuit of Magnet recognition as the roadmap to nursing excellence, improved patient outcomes and a rewarding practice environment. While working at Memorial Hospital, Weston has inspired the nursing staff to grow professionally by championing a nurse recognition program which rewards nurses for serving as preceptors, working on councils, obtaining certification, continuing education, engaging in research activities and supporting community endeavors. Weston has also implemented shared governance and created a Nurse Recognition Program. She serves on the boards of the United Way and the YMCA. Weston is a member of the inaugural class of the SIUE Alumni Hall of Fame.